The first full day of the Big Ideas Fest in Half Moon Bay included a “Rapid Fire” presentation by Barbara Chow (Education Program Director at Hewlett Foundation). Barbara talked about the importance of Federal policy and new school models. 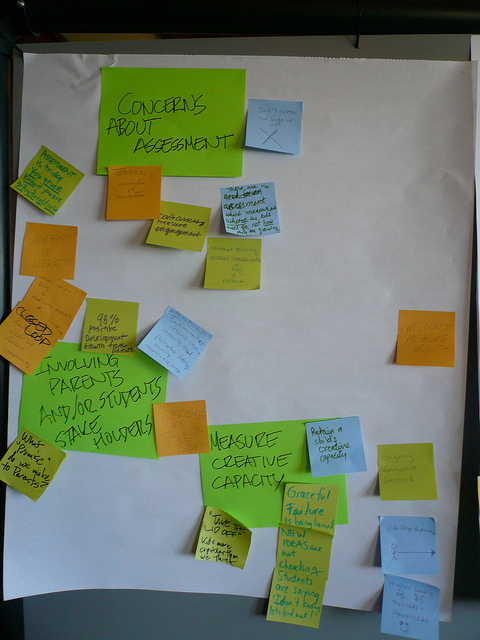 The need for “real time assessment” was also discussed. Students need (and deserve) to get “the right data at the right time.” People were talking about “Course Signals” – a tool that gives a student a green, yellow or red light to indicate their chances of passing a course. The signal is based on the passing rate of past students who have performed similarly up to the same point in the course. Apparently the simple signal greatly improves the pass rate because students who get a red or yellow warning take action before it is too late. The Ford Fusion dashboard was provided as an example of real time feedback. A green plant is shown on the dashboard. It gets greener if the car is driven in an eco-friendly way, and shrivels if the car is not driven responsibly. Apparently this real time feedback has greatly improved the driving performance of Fusion owners. The symbol was developed by IDEO using the same “Action Collab” process we are using at the conference. To spark creative thinking, I led my group through five different ‘Improv’ activities – something I never imagined doing but find very effective now that I have gotten training from the pros on how to do it. Improv, it turns out, is not about being funny. It is about being “present” and connecting with people in new ways. I am all set for tomorrow’s “proto-storming” session in the Collab. We will be using RAFT materials to create a physical model of our assessment system. Time for lights out!